For decades, do-it-yourself living arrangements have gained popularity. Today, squats and warehouses are at risk, while the number of houseless people is skyrocketing. 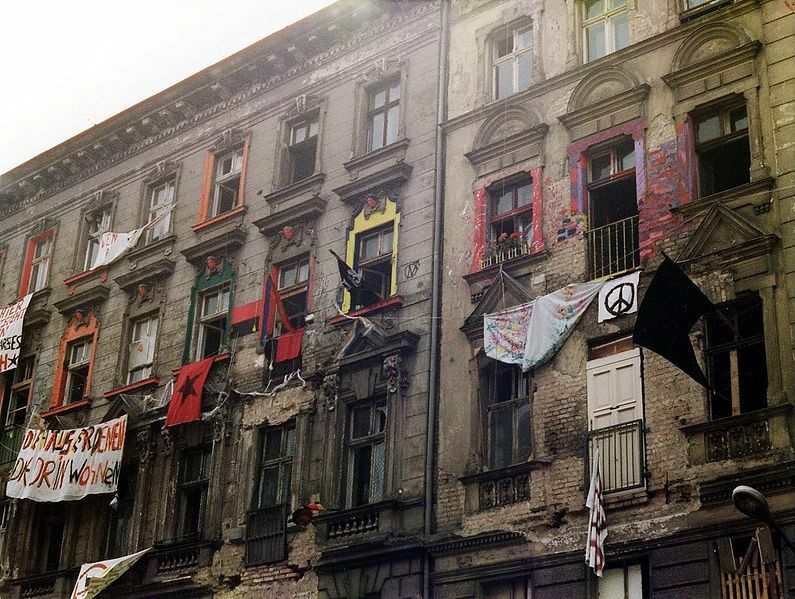 Exterior of a squat in Berlin’s Mainzer Strasse, 1990. Courtesy of the Matador Network. Droogdok Maatschappij looks a lot like any other artistic community. 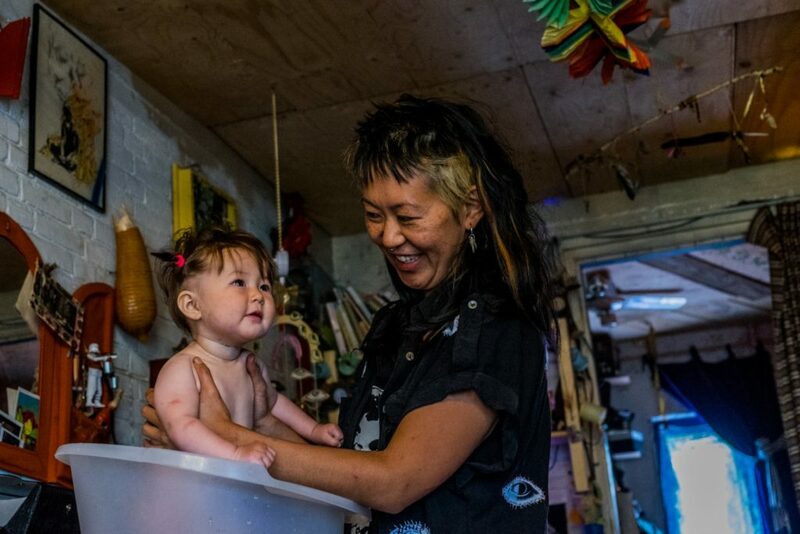 Sanne Derks’ photo essay on the community for the Guardian reveals images of bohemian domesticity that would not be out of place in Brooklyn or Berlin: a woman with a two-tone mullet bathing her young daughter in the sink, a community cafe in a small trailer with a chalkboard sign advertising coffee, a couple relaxing in their neon green kitchen. The difference between Droogdok Maatschappij and, say, a co-op in Portland, is that the former is a squat that has been illegally occupied since 1997, and, as of October 2018, Dutch authorities have ordered all 125 members to vacate the premises by Christmas. The closure of Droogdok and several other artistically-minded squats around Europe and the United States has shone a light on the practice of squatting and other do-it-yourself spaces, where tenants are largely responsible for providing their own utilities, repairs, and establishing their own societal guidelines. Squats and other DIY living spaces challenge our typical notions of what living situations should look like. The traditional Western model of a household consisting of a father, mother, and their biological children emerged from the Protestant Reformation, in which Christian leaders started centering daily life around the “domestic divine” rather than the Catholic Church. In the 1800s, during the Industrial Revolution, more people began leaving their households to go to work rather than centering their days around homesteading and agriculture. With distinctions between the public and domestic sphere becoming increasingly rigid, more people chose to draw distinctions between family, friends, and community members, and live with what would eventually be called their nuclear families. While this is still the norm for many Western households, non-Western societies continue to incorporate elements of communal living into their daily lives, through intergenerational homes and chosen families. However, due to many factors including economic uncertainty and rising unemployment rates, non-traditional households are increasing in the United States– the 2010 US census found that non-family households are increasing faster than those of traditional family households. Trends in living arrangements are moving away from the nuclear-family model and towards less traditional living. In the decades following the destruction of World War II, European and U.S. cities were experiencing infrastructural breakdowns, while a new generation was demanding housing of their own. In England, where the war had left many families and veterans impoverished and homeless, the Communist Party and Women’s Voluntary Service helped some 40,000 people locate places to squat, in residential and industrial properties. Similarly, in Rome, the Social Center Movement (Centri Social), grew out of a wave of occupations of residential and commercial property in the 1950s and 1960s. In the 1970s, a second wave of squats-as-societies emerged “in response to the rigidity of top-down, modernist, organized post-war reconstruction and … suburban developments.” In comparison to post-War development efforts, squats were more bohemian, communally-oriented, and creative. In West Berlin, squats emerged in the Western neighborhoods of Kreuzberg and Schoneberg in the 70s. As a response to the struggles of the late-20th century West German economy, a movement, Schwarzwohnen, began, with almost 1300 recorded squatters in the country in 1987. In 1974, members of the South London Gay Liberation Front (SLGLF), built a commune in a series of abandoned homes in Brixton, complete with a café and community center. Meanwhile, in 1979, a group calling themselves the Committee for the Real Estate Show broke into a commercial building at 123 Delancey Street in New York’s Lower East Side. The Committee installed an art show in solidarity with Elizabeth Mangum, a woman who had been killed by police in an eviction from her Flatbush apartment earlier that year. 123 Delancey eventually became an artist’s squat, followed by a proliferance of similar collectives in New York City’s Lower East Side and SoHo, including Storefront for Art and Architecture, the Nuyorican Poets Cafe, ABC No Rio, No Se No, the Rivington School, Freddy the Dreamer, and the Clemente Soto Vélez Cultural Center. Padmini Peng with her daughter. Courtesy of Sanne Derks via The Guardian. In the 1980s and 90s, squats became synonymous with the punk and anarchism scenes. In England, under conservative Prime Minister Margaret Thatcher, squats provided a form of radical political dissent. The Dole House squat doubled as a punk venue. Meanwhile, CoolTan, a collective housed in a disused suntan lotion factory on London’s waterfront, had community organizing meetings, a vegan café, and organized parties and raves that raised money for social causes. CoolTan is now CoolTan Arts, an licensed organization dedicated to art therapy. In London, living in squats in the 1980s was a mark of desirable bohemianism: Tracey Emin, Damien Hirst, and Jeremy Deller all lived in London squats. Following the fall of the Berlin Wall in 1989, activists took advantage of the political vacuum left in East Berlin and converted property there into squats. Squats of the early 2000s were less overtly political than their predecessors, and more focused on the production and performance of art. The art collective !WowowoW! emerged out of a squat in Peckham, England, with members including the designer Gareth Pugh and video artist Adam Faramawy. Bobby Dowler, an artist who lived at 78 Lyndhurst Way, a squat which existed from 2005-2008, says, ‘“I wouldn’t say that any of [the squatters] were particularly political … We were more artists than socialists. But I think what we did was a political decision. We went against the normal way of living, i.e. paying rent and the pursuit of the accumulation of material objects, etc. We rejected all that.” Despite being less explicitly political than its predecessors, art squats of the 2000s have had a lasting legacy in terms of how art is shown, even in commercial spaces. Dowler notes, “It’s interesting that Bold Tendencies and Hannah Barry Gallery both sprang out of what we were doing.” Meanwhile, some squats have become legitimate art spaces in their own right, like Area 10 and Auto Italia South East, bridging the gap between Art Squat and gallery. In Paris, 59 Rue de Rivoli, a long-abandoned building squatted in 1999 by three artists playfully nicknamed “The KGB,” was bought by Paris in 2005 and declared a studio and performance space. Today the building, situated between the Louvre and Paris’s City Hall, is home to twenty long-term artist/residents, with ten spots open for shorter residencies. In 2015, the housing group Assemble, whose work surrounds reclaiming abandoned living spaces in Liverpool, won the prestigious Turner prize, despite none of the members identifying as artists. 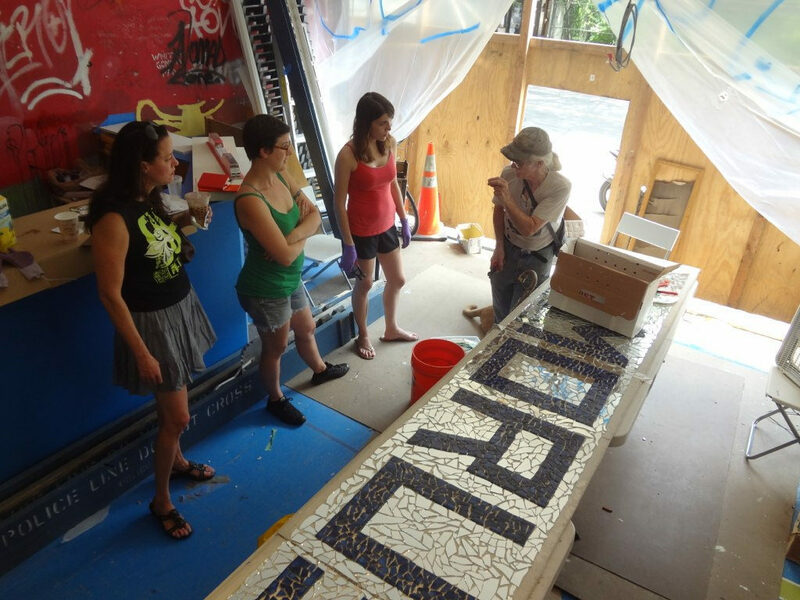 Meanwhile, the Museum of Reclaimed Urban Space, founded in 2012, is an art group, museum, and community organizing collective based out of C-Squat, one of New York City’s eleven remaining art squats. In New York City, these squats are loosely tied together through a 2002 agreement made with city officials, in which the squat buildings were bought by nonprofit intermediaries, who provided squatters with loans to bring the squats up to code. Consulting on the construction of the Museum of Reclaimed Urban Space. Photo by Amy Starecheski via Sapiens.org. Despite the cultural support for squats, there are several practical threats to the squat-art movement. In addition to the impending closure of Droogdok Maatschappij, in 2007 Copenhagen police rushed the Ungdomshuset (Youth House) Center, a central space in the city’s squat movement. In 2012, a 21-year-old was arrested in central London, becoming the first person to be jailed under the government’s anti-squatting legislation, which outlaws living rent-free in residential property. Then, in December of 2016, a fire erupted during a party in the second story of Oakland’s Ghost Ship warehouse, killing 36. The fire at the Ghost Ship led, directly or not, to a rash of squat and warehouse evictions across the US, including the shutdown of Denver’s Rhinoceropolis and Glob, the Bay Area’s Bridge Storage and ArtSpace, Brooklyn’s Aviv and Palisades, and Baltimore’s Bell Foundry. Squatters and other proponents of DIY spaces contend that, while these collectives may be practically unsafe, these communities provide a lifeline for many young artists and activists. 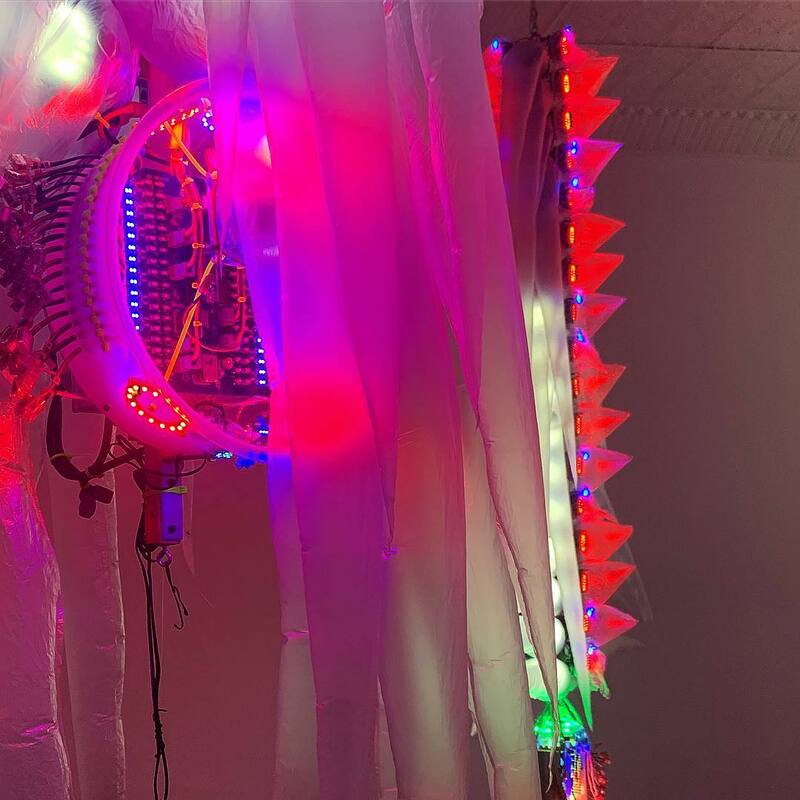 Brian Chippendale, a visual artist who has lived in several DIY art spaces, writes of Providence’s Fort Thunder squat, “It wasn’t just a space, it was a living organism. It came to be the only art that made sense to me …. 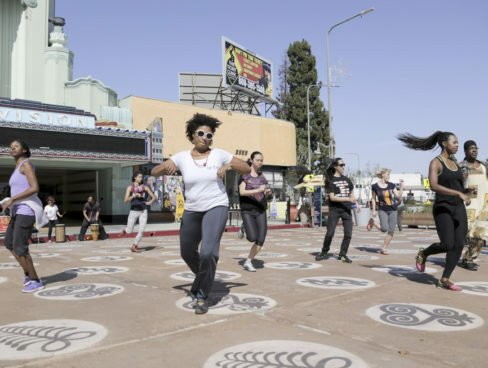 It’s communities like these that grow the roots that allow a city to form its own artistic identity.” Despite the anti-government, anti-state attitude of many squats, community art production leads to culture that can define and ultimately benefit a city. 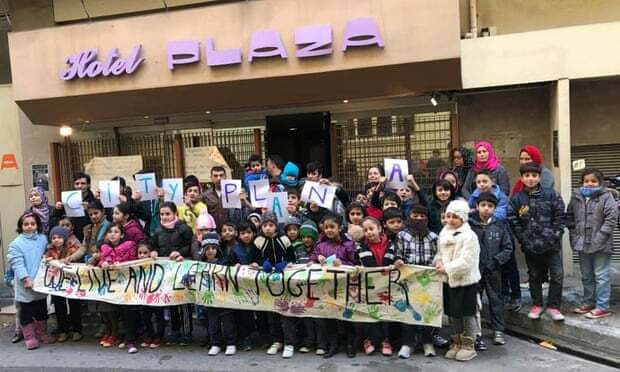 City Plaza residents hold a sign that reads “We Live and Learn Together.” Courtesy of City Plaza via The Guardian. It is important to note that people can choose to squat for many reasons, with artistic inclinations being only one of them. For the displaced and disenfranchised, housing is often the first thing to go, and individuals seek out alternative living arrangements in whatever form they can find them. In Spain, for example, approximately 250,000 seizure orders were served on Spanish homeowner’s properties between 2008 and 2012, with little support for now-destitute homeowners. In response, the grassroots group Platform for Mortgage Affected People (PAH) actively obstructs evictions and has occupied many blocks of abandoned apartments and houses–in particular, properties owned by banks that were bailed out by the Spanish government– for squatting purposes. In 2017, some 800 refugees were evicted from a Rome office building where they had been squatting for five years. 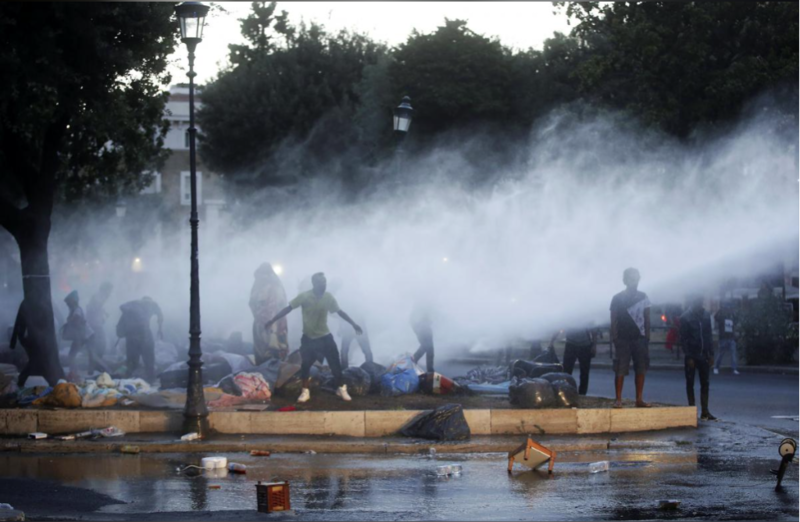 Following this eviction, 100 of the squatters took up residency in the nearby Piazza Independanza, until Italian police officers armed with water cannons and batons evicted them from the square. According to the UN Refugee Agency, there are 68.5 million forcibly displaced people worldwide (this number is made up of internally displaced people, refugees, and asylum-seekers). The alternative to squatting, for these refugees, is life in government camps, which is extremely difficult. In 2017, several refugees froze to death at a government camp on the Greek island of Lesbos, while others were poisoned by carbon monoxide from makeshift heating devices. Refugees in Piazza Independanza are met with water cannons by police. Courtesy of Yara Nardi via Reuter’s. The case of Athens’s City Plaza Hotel is a perfect example of how models of communal living that we predominantly associate with bourgeois bohemianism can transcend the worlds of art- and music-making, and actually have a tangible impact on global crises like the treatment of the world’s refugees. In 2016, after a deal between the European Union and Turkey cordoned off several European entry points and left some 60,000 emigrants stranded in Greece, activists squatted the abandoned City Plaza hotel for 400 refugees. Like many other kinds of squats, City Plaza functions as a community center in addition to a housing space, with a cafeteria, clinic, and language classes. A photo series, “We Are City Plaza,” initiated by photographers Xiafu Wang and Claude Somot, shows the diversity of City Plaza’s inhabitants, which include refugee families, students, volunteers, and activists. Several researchers have visited the squat to observe the project, and many believe that City Plaza should be a model for best practices for other refugee housing projects. As global rates of displacement reach an all-time high, it is time for governments and human rights organizations to consider re-appropriating unused residential and corporate spaces as communal living spaces, and taking notes from the organizers, activists, and artists who have pioneered these alternative modes of living.